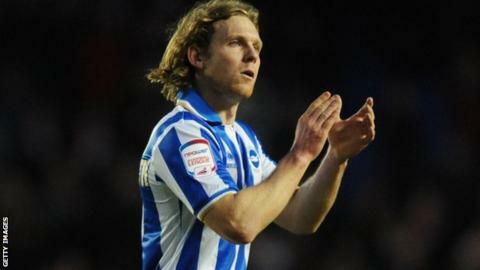 Brighton & Hove Albion striker Craig Mackail-Smith was thrilled to make his comeback after 13 months out injured. The 30-year-old made his return to action as a second-half substitute in the 0-0 draw at Barnsley on Saturday. The Scotland international told BBC Sussex: "It has been a long time and to get on the pitch was a great feeling. "It was probably the most relaxed I've been sitting on the bench. I was really excited to be involved and I was just enjoying the moment." Mackail-Smith, who came on in the 78th minute against the Tykes, had been on the sidelines since tearing his Achilles tendon against Bristol City in March 2013. The former Dagenham and Peterborough man then picked up ankle and groin niggles during the course of his return to fitness. "I've worked as hard as I can and done everything to make sure it is strong enough," he said. "I was hoping I would sneak onto the bench on Friday and was told before the game. Then it was a matter of time to see if the gaffer wanted to introduce me. "It was a big injury and I realised how quick it can all change. I went on and tried to enjoy it as much as I could." Mackail-Smith says the amount of time he spent out injured has been tough but he is now determined to play his part as the Seagulls chase a Championship play-off place. "Missing that much football has been hard but you get these injuries in football," he said. "There were times when I was thinking 'how long is it going to be?'. "I knew I had to be patient and bide my time with little injuries and make sure my body was right for my return. I didn't want to come back and break down. "I've had to be positive, knuckle down and work hard to make sure I come back and don't disappoint myself. "I'll do everything to get back to the player I was and hopefully push on even further than that." Brighton head coach Oscar Garcia says Mackail-Smith will boost his attacking options. "I am happy for him because he deserves to play these minutes," Garcia told BBC Sussex. "He waited for a long time for this moment and we wanted to get him fitter and fitter. "It is very hard to spend more than one year without playing professional football but now he is ok. He will be a good addition for our squad."